Ted Young, Gunflint Trail-The other day Julie Collman, Cook County Deputy Sheriff; John Jacobsen, Grand Marais; Ashley Jacobsen, student at Superior State College; and I retraced a trip into an old logging camp on Vance Lake that Julie had visited more then twenty years before with her parents. When first visited by Julie, much of the original camp was still intact. She recalled that there were twenty-four old building on the site at the time of her first visit. Our quest to find the old camp began with a canoe trip across the east end of Brule Lake then over the portage to Echo Lake, down Echo to near the east end where we beach our canoes. 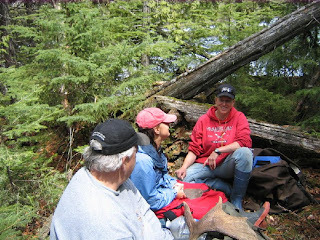 We then bushwhacked about a half mile through thick “blowdown” north to Vance Lake and then to the east end of Vance where Julie recalled the camp was located. Upon reaching the east end of the lake, our first discovery was the remains of small log building by the shoreline with a culvert buried in the ground that we speculated might have been the camp’s water source or maybe a small boathouse. Searching the area further we found the remains of a large log structure build into a side hill. There were trees growing out of this building. This build was large enough to have been the camp’s mess hall. We also came across many cleared areas that we presume were the sites of other structure and of course we found lots of rusty tin cans. But the other buildings Julie had previously seen were gone. One unexpected fine located on the site was a test pit or mine. The pit was located about one hundred feet north east of the remains of the large log structure. The pit was filled with water so we could not tell its depth. Around the pit were many pieces of jasper that appear to have come from the hole. We can only speculate that at sometime prospectors must have taken up residents at the camp. It was likely that the camp was in operation sometime during the 1940-50s. 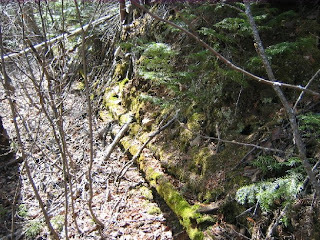 During this period it would be likely that the logs were trucked out in the winter through a frozen creek-lowlands passage lying just north of the camp. This creek flows east about one and a half miles to the northeast corner of Brule Lake. From there the trucks could travel across Brule Lake over an ice road. The High hills and steep cliffs surround most of Vance Lake would make this one of the few places trucks could have readily travel to and from the camp. However, John Lyght, life-long Lutsen resident, former county sheriff and who trucked timber across Brule Lake for the Davis Lake Timber sale felt the Vance Lake Camp was operating in the 1920’s. The deterioration of the two remaining building in my mind would certainly indicate this. If this were the case then logs were hauled to the railhead of the Alger-Smith Logging Rail Road. The railroad had spur lines going into the Brule and another line into a logging camp on Swan Lake and possible as far as Vernon Lake just east of the Swan Lake camp. Somehow logs would have to have been hauled to one of these two railheads. After exploring what remained of the camp we retracing our route out across Echo and Brule Lakes and home. We can only speculate when the camp was in operation and who were the many folks that lived and worked there. Why was there a test pit or mine at the camp? And what were these prospectors looking for? Our trip only raises more questions then it answers. We would like to know more about the Vance Lake Logging Camp. Therefore if anyone has any additional information about history of this camp we would very much like to hear from you. Editors note- Since we were unable to find the twenty four structures Julie had previously seen on her earlier visit, I can only speculate that the Forest Service burn these structures just as they had burned the Davis Lake Logging Camp, Benny Ambrose’s cabin and other historical structures in what is now the BWCA. The explanation I have heard from Forestry officials for burning these building was that these building were in a “wilderness area” where people were not suppose to have lived. However this goes without say people have lived there for thousands of years. Other Forest Services officials have told me unoccupied building in the BWCA would be vandalized. To me burning these old building and pretending that these buildings and the people that lived and work there never existed is the ultimate form of vandalism. Thankfully, the Forest Services policy of trying to destroy the past by burning it has been changed and they now recognize that maybe historical structures within the BWCA should be allowed to remain. Nordic Skiing is normally considered an eco-friendly sport, northeast Minnesota’s Gunflint Nordic ski trail managers have taken this one step further. The Central and Upper Gunflint Ski Areas connected by the Banadad Ski Trail known collectively as the 210 Kilometer Gunflint Nordic Ski System this year went carbon neutral. The trail managers calculation the cost of sequestering the carbon emissions produced from the maintenance and grooming of the trails based on information from the Chicago Climate Exchange, “Regional Estimates of TreeAnnual Carbon Accumulation,” and the Gunflint Ranger District, USFS tree plant cost estimates. Then, yesterday, May 5, at the Gunflint Trail Association’s Spring Meeting ski trail representatives presented a $896 “carbon off-set” check to Nancy Seaton, Gunflint Green Up chairman, The money will be used as seed money for next year’s tree planting. Since the Gunflint Trail’s 2007 Ham Lake Fire, the Gunflint Green Up has annually purchased young trees and organized volunteers to plant the trees. To date the Green Up has planted over 100,000 new trees in the area burned over by the Fire. Resorts participating in Gunflint Nordic Ski Trail’s Carbon Off-set project are Gunflint Pines, Hestons and Gunflint from the Upper Gunflint Trails: Boundary Country Trekking from the Banadad and Bearskin from the Central Gunflint Trails. Golden Eagle Lodge, that maintains half of the Central Gunflint Trail offset the carbon their maintenance and grooming created by planting trees on their own property. Note- Attached image- Left to Right Ted Young, Boundary Country Trekking, Nancy Seaton, Gunflint Green Up Chairperson, Dennis Neitzke, Gunflint Ranger USFS, Shari Baker Gunflint Pines Resort, and Sue McCloughan, Bearskin Lodge. May 9- one inch of snow covered the ground this morning along the mid-Gunflint Trail area and the snow continued to fall until about 10:00 am. By late afternoon the fresh snow was gone. On the other hand, Poplar Lake did see its fishing opener, even though most in the area were saying Poplar and other mid size lakes in the area would still be ice covered for the opener. The ice actually went-out yesterday, the day before the opener. Here around Little Ollie Lake, as a follow-up to last week's Gunflint Green Up, several neighbors were out planting more trees. Most planted on their own property. Poplar Creek Guesthouse B&B, this year, planted white pines on the trail to the Tall Pines Yurt. While walking along the Little Ollie Road it was clear that most of the white pines and spruce planted last year along the road had survived the winter and appeared to be doing fine. While much of the Banadad Ski Trail still has plenty of snow there are signs that spring is arriving. The ice went out on Little Ollie Lake yesterday. Poplar and other mid size lakes are still covered with ice.It is doubtful whether the ice in these lakes will go out before the fishing opener on May 9th. In the woods and on north facing slopes snow remains- in some places up to a foot deep. However, about a week ago the season’s first loon was spotted flying over Poplar Creek Guesthouse B&B.